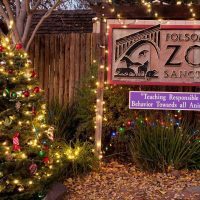 Celebrate the magic of the season and help support the amazing animals at the Folsom City Zoo Sanctuary. Thousands of colorful lights decorate the grounds, buildings and animal exhibits at the zoo. An enchanted forest of beautifully decorated trees provides a colorful backdrop for Santa’s nightly visits, carolers fill the air with seasonal cheer, and zoo bear mascot Santa Paws greets guests and poses for photo ops. This event also provides a unique opportunity to see some of the zoo’s animals who are more active at night, and zoo docents are on hand to share fun facts and answer questions about the animals. Come experience the holiday magic!